CMOs spend about 20% of their budget on creative, yet 71% of them don’t believe in its ability to drive results, according to Nielsen’s 2018 CMO Report. Unwilling to be part of this growing creative confidence crisis in marketing, Pier 1, a leader in home furnishings and decor, decided to take a more scientific approach. At Oracle MCX, Pier 1’s Tessa Pierce and Persado’s Ryan Deutsch shared the results and how they got there. ICYMI, this case study provides a look at the presentation. For more than five decades, the creative process hasn’t really changed, Deutsch noted. It’s based on creative people, some qualitative data, guesswork and opinions. Take this Facebook ad. It’s broken down by the text, image/background, text overlay and headline. Pier 1 wanted to join the movement of industry leaders using AI and data science to deploy creative with mathematical certainty. The Persado Message Machine uses the world’s largest data-driven knowledge base of creative marketing messages and language, Deutsch explained. The self-learning machine utilizes artificial intelligence and machine learning algorithms to continuously evolve its understanding of how the exact right message personalized to each consumer and at scale can drive the maximum brand engagement and revenue result. It looks at many different aspects of a message, defined below. Pier 1 sought to use this approach to understand how customers respond to changes in marketing copy. 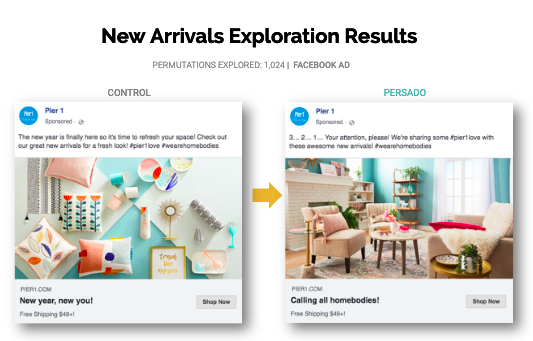 Pier 1 began testing the impact of language optimization across the customer experience in Oct. 2018. The technology has helped them achieve substantial value across their initiatives in FY19 so far. Below, you can see how AI transformed the original message to something that clearly resonated better with Pier 1’s audience. 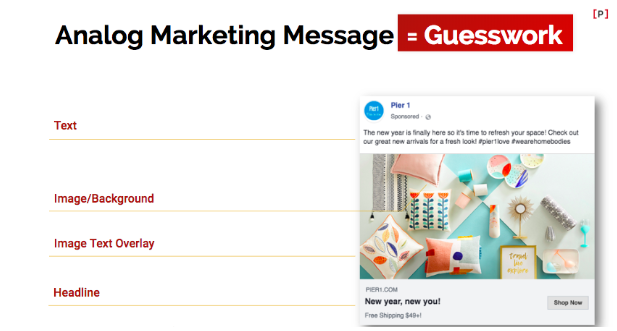 The photo change made the biggest impact for Pier 1 and formatting contributed to 45% of the engagement. Overall, emotion contributed 30%, with Curiosity-evoking “Calling all homebodies!” leading the way at 17% and “3, 2, 1…” coming in at 9%. The #pier1hashtag, which highlights new arrivals and evokes Fascination, contributed 4%. The Description of the offer (“free shipping $49+!”) was responsible for 25% of the engagement. By quantifying the impact of different words and phrases, CMOs can have a new lens into their marketing messages, instilling confidence that they’re using the right words to drive maximum results and create the best digital experience for their customers.